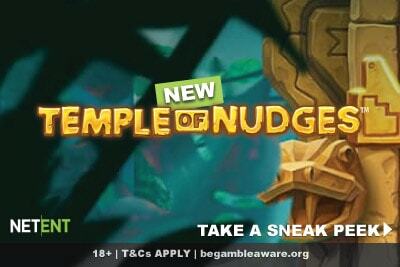 Update: The Temple of Nudges slot is now out to play at all good NetEnt casinos like Casumo. 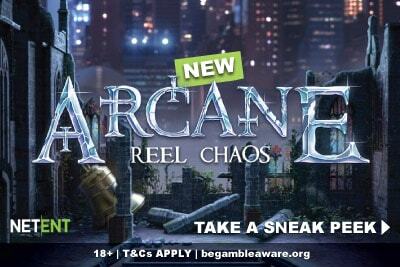 Or before you play you can read our Temple of Nudges slot review to find out even more about this new game. 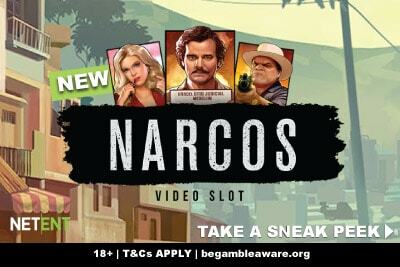 On the 21st of March NetEnt will release the Temple of Nudges slot online to all their biggest casino partners. Here's why it should be on your radar. We are getting two NetEntertainment slots in March 2019. The first is Scudamore Super Stakes on the 7th, which will make the biggest splash of the two. Not only is it a branded game, but as we wrote in our Scudamore slot preview, it’s got lots of fun virtual betting options that will no doubt make sports fans eager to spin. So while every online casino will be pushing this big brand game, we are going to hold the torch up to the underdog of the month, the Temple of Nudges video slot. Which is not a copy or a re-skin of an old game, but totally original, and (in our eyes) will have a far bigger mass appeal. Take a quick look at this bright and colourful temple and tell us it doesn’t bring to mind one very specific slot machine. If you didn’t say Gonzo’s Quest online slot then you are clearly not as big a slot geek as we thought. Good for you! You have a life! For everyone else who sits comfortably in our little casino world, you’ll be happy to know that this isn’t a copy of the more famous game. Temple of Nudges may be inspired by those ancient Inca temples, but it’s not gold you are looking to hunt down, but the favour of these animal gods. That’s what we really mean about back to basics. In essence, NetEntertainment is creating a simple, easy to understand video slot machine with only two features. The first is that on any win, the reels will nudge down by one. So you may get another win, which leads to another nudge, and so on and so on… a very fun twist on traditional cascading slots. The second is the possibility of getting a sticky win, like in their Jack Hammer 2 casino game. It won’t happen as often as the nudge feature, but it’s possible that stacks of symbols stay on screen while the rest of the reels re-spin for a second chance win. The thing about simple slot features is that they usually need a partner in crime to make them work properly. So, for example, the walking wilds in Halloween Jack on mobile are fun, but it turns into a 5-star slot because those wilds grow during the free spins. The Wild Beats slot game by Playtech basically only has wild symbols. But two wilds in the right spots give you a flurry of up to 9 wilds on screen which makes your heart skip. What gives us hope about this Temple of Nudges game is that it has stacked symbols – helping make that nudge feature a little more exciting. After all, a nudge on a win is only exciting if you think there are more winning symbols hiding just behind view. 3. Is Temple of Nudges a low variance slot to rival Starburst? Usually, we get excited about high variance slot machines with huge jackpots of 5,000 times our bet or more. This isn’t it. Temple of Nudges boasts a max win of €90 on a single bet way. Which, considering that this is a 243 ways to win slot, means that if you get a whole screen of the highest paid symbol you’ll win a maximum amount of €21,870. That is… not a lot. We are talking wins of what… 100 times our bet? If that? Do you know what is the top win of the iconic Starburst? 500 times your bet. People love it because you have the opportunity of lots of little wins often, and occasionally big enough wins to let you walk away with 25% or 50% more than you came in with. Now, the numbers we talked about above may not sound that impressive, but you know what? That’s the amount you could win in one spin. That spin will then lead to another nudge. Which means you could win that amount, or close enough, again. And again. And again. 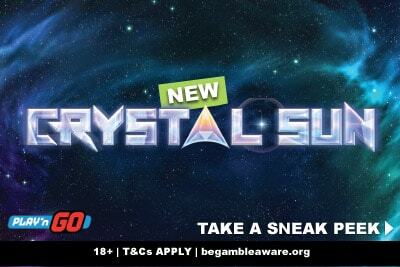 If this mobile casino game follows the Starburst formula, it might surprise you enough to keep you spinning. At heart, the Temple of Nudges slot is a 243 ways to win 5×3 game with only 8 symbols and two features: nudges and re-spins. With small and constant wins, we think this may be a sleeper hit for NetEntertainment. Sometimes, you don’t need to risk it all to win all. Sometimes you want to just risk a little to win enough. The good news is that with so many online NetEnt casinos around, finding one to play at while you wait won’t be a problem. If you are looking for some light-hearted spins why not reacquaint yourself with the Spinata Grande slot machine ? The best place to play a happy slot is at a happy casino, and none are as cheerful or as accommodating as the bonus and staff at Vera and John mobile casino.